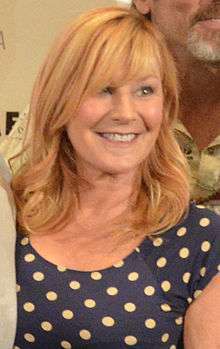 Chloe Webb (born June 25, 1956) is an American actress, best known for her roles in films Sid and Nancy (1986), The Belly of an Architect (1987), Twins (1988), and Heart Condition (1990). She also was nominated for an Primetime Emmy Award for her role as Laurette Barber in the ABC drama series China Beach, and has a recurring role as Monica Gallagher on the Showtime comedy-drama Shameless. Webb was born in New York City and grew up in various cities on the East Coast – depending on where her father was working at the time; he was a bridge and road designer. She spent much time with her grandmother, who resided in New York City. She attended an all-girls Catholic high school before enrolling at The Boston Conservatory and later, Berklee College of Music. Originally, Webb pursued her passion in singing by singing in bars despite being underaged; she realized that even though she was greatly enjoyed singing, she was better at acting. In April 1982, Webb joined Forbidden Broadway, an Off-Broadway revue parodying musical theatre, particularly Broadway musicals. Four years later, she made her film debut in Alex Cox's Sid & Nancy (1986); she portrayed the infamous, heroin-addicted Nancy Spungen, girlfriend of punk rock singer Sid Vicious. Her performance garnered best actress awards from The National Society of Film Critics, The Boston Film Critics and the The San Francisco Film Critics. Followed were the roles of Brian Dennehy's estranged socialite girlfriend in Peter Greenaway's 1987 drama film The Belly of an Architect; a young woman from Paoli, Pennsylvania with dreams to become a successful singer in ABC's drama television series China Beach; Webb appeared in only seven episodes. Other roles include Danny DeVito's character's eccentric girlfriend in Ivan Reitman's comedy film Twins (1988), and a cameo as a woman convinced that she had been abducted by aliens in Ghostbusters II (1989). Between roles in motion pictures and television series, Webb frequently appeared in several Los Angeles based stage productions: The House of Blue Leaves, for which she won a Drama-Logue Award, and The Model Apartment; her performance earned her a Los Angeles Drama Critics Circle Award and another Drama-Logue Award. At the start of the decade, Webb co-starred alongside Denzel Washington and Bob Hoskins in Heart Condition (1990). In 1991, she had assumed the role of a hairdresser in the comedy film Queens Logic. The same year, Webb played a woman with a developmental disability who wins the lottery but her fortune leads to tension between her mother and sister in ABC’s made-for-TV film Lucky Day. There followed the roles of an Australian Red Cross worker in the drama film Silent Cries (1993), Debra Winger's character's colleague in Stephen Gyllenhaal's A Dangerous Woman (1993), and the eccentric Mona Ramsey in Armistead Maupin miniseries Tales of the City (1993). Other roles in this decade include Annette Bening's friend in Love Affair, the 1994 remake of the 1939 film of the same name, Robin Wright's character's friend in She's So Lovely ,and Sandra Bullock's friend Carla in Practical Magic (1998). The turn of a new millennium found Webb assuming guest spots in several television series: CBS's Judging Amy (2003), FOX's House (2005), CBS's Two and a Half Men (2005), NBC's Medium (2005), and CBS's CSI: Crime Scene Investigation (2008). Webb reunited with Cox in 2009 for his film Repo Chick; she played Sister Duncan. Webb's most recent role was as Monica Gallagher, William H. Macy's character's estranged and unstable wife in Showtime's comedy-drama TV series Shameless; her performance earned her a nomination for Critics' Choice Television Award for Best Guest Performer in a Drama Series. 1983 Remington Steele Secretary Episode: "Steele Away with Me: Part 1"
1986 Mary Actress Episode: "Steppin' Out with Mary Brenner"
2003 Judging Amy Mrs. Goodman Episode: "Tricks of the Trade"
2005 House Cora Episode: "DNR"
2005 Two and a Half Men Trudy Episode: "That Old Hose Bag Is My Mother"
2005 Medium Margaret Folsom Episode: "Time Out of Mind"
2008 CSI: Crime Scene Investigation Evelyn Polychronopolous Episode: "The Theory of Everything"
↑ Buck, Jerry (March 9, 1991). "Fortune Smiles On Chloe Webb". The Free Lance Star. Retrieved 5 May 2014. ↑ "2012 Critics' Choice Television Awards Announces Nominations". CriticsChoice.com. Retrieved 5 May 2014. ↑ Reiher, Andrea (2012-06-05). "'Community' and 'Mad Men' lead 2012 Critics Choice nominations". Zap2it. Retrieved 2014-04-20.